This blog will share my love of gardening, plants and outdoor living. There is more to a garden than just plants, and my aim is to cover everything from plants to patio furniture to landscaping. Join me for tips, ideas and even recipes using home-grown produce. The picture below is of one of my garden beds (4' X 4') Summer 2011. 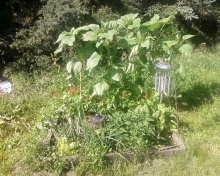 I planted Scarlet Runner beans next to the sunflowers to utilize the space. The garden bed produced a lot of food with minimal weeds due to the plants being close together. It is NOT a good day for gardening in my area today! We have a mixture of rain and snow which I know will be good moisture, but it would sure be nice to get out there and finish getting my garden beds ready for planting. Before I get too far into today's post, I just want to let you know about a group page I have started on Facebook. If you are interested in the variety of gardens and gardening methods from different parts of the world, join today. Lavender - this is one I love, but have never been able to grow easily. It is a low-growing shrub-like plant and comes back year after year. Several years ago a friend from Ontario sent me some dried lavender she had grown in her garden; I still have it in a cloth bag in my dresser even though the scent is all but gone. Chives - the past couple of years I have overwintered them inside and have been able to enjoy them fresh in meat dishes and dips. I have grown both onion and garlic chives. Strawberries - these are great for hanging baskets and vertical planters in addition to raised beds and traditional rows. My Grandma had a 3-tier circular strawberry planter in her garden; it produced a lot of berries which were easy to access as the bed was only four feet in diameter. Marigolds - I have been planting these amongst my vegetables as they help keep the mosquitoes away. They are not 100% effective, but are pretty and do help. Not only that, certain varieties are edible. Citronella - A very aromatic yet effective form of mosquito control. Keep in mind no plant seems to keep them all away, but I am happy with the results nonetheless. Tomatoes - I usually plant a few varieties of these; cherry, Roma, and Beefsteak are my favorites. The homegrown tomatoes have so much more flavor than store bought. It is important to pinch back side shoots and the tips when the plants have reached the height you desire. This will encourage bigger fruit and less rampant plants. I also suggest caging them when planting as they tend to grow fast and are harder to cage when bigger. Fuschia - These are one of my favorite flowers. My Grandma had one hanging in her living room and I can recall squeezing the buds so they would open faster. They are very pretty; especially the double flowers. I encourage you to think outside the box and try at least one new species a year. some times the varieties of the Heirloom tomatoes ones are fascinating like Oxheart/Oxblood or the little yellow tomatoes....look for different ones. I prefer the yellow tomatoes because they are lower in acid than the red ones. My husband likes any variety of tiny tomatoes that he can just pop into his mouth. Any suggestions for something in a plant pot that will attract hummingbirds to my balcony? First of all, how high is your balcony? Secondly, I would suggest a feeder so they know there is a food source there as they arrive before most plants can be put out. Once they know there is food, they will return. Columbines, nasturtiums, morning glory, scarlet runner beans (these are dual purpose) and honeysuckle are all good sources of food for the hummingbirds. For a more complete list of tips and plants for attracting hummingbirds, visit http://www.hummingbirds.net/attract.html. I really love all of these plants. They are beautiful and really suit a purpose, too! They're my favorite for my garden. Thank you for taking the time to comment Jen - have a great weekend! I love most of them but if I have to make a choice I will surely go for orchid and its various species. What do you think? Personally I have not had much experience with orchids. I rescued on from my sister a few years ago when she moved (she was going to throw it out) and this spring it finally grew a flower spike. Unfortunately the spike died before it bloomed. I do agree that the orchids are very pretty and fragrant, as I have seen them on display in a conservatory. Perhaps one of these years I will attempt to grow them. I have not given up on the one I have yet; it still sits on a shelf next to a window. Copyright Diane Ziomek 2012 All rights reserved.. Awesome Inc. theme. Theme images by dfli. Powered by Blogger.